Who Is Attorney General Bill Barr, Who Will Release The Mueller Report This is not the first time Bill Barr has led the Justice Department. The seasoned D.C. lawyer has expressed expansive views on the powers of the president — and supported past presidential pardons. 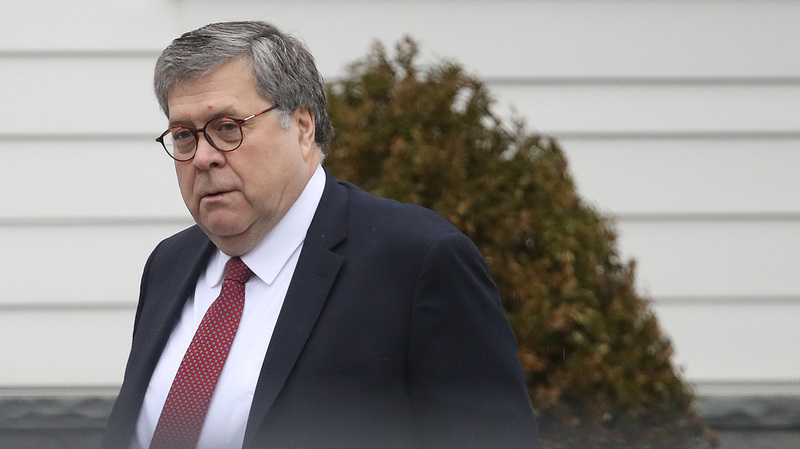 Attorney General William Barr, seen leaving his home on March 21, will determine how much of the Mueller report to release to Congress and the public. With the completion of special counsel Robert Mueller's investigation into Russian interference into the 2016 presidential election, attention now shifts to Attorney General William Barr, the man who will determine how much of that report to make public — along with what information will be provided to Congress. This is Barr's second stint as attorney general. He previously led the Justice Department during the administration of President George H.W. Bush from 1991 to 1993, during which time he was Mueller's boss, when Mueller was in charge of the Criminal Division at DOJ. Barr and Mueller are said to be friends, and Mueller attended the weddings of Barr's children. Still, before his nomination by President Trump, Barr criticized some members of Mueller's team for their political contributions to Democrats, and wrote a memo critical of the legal basis upon which Mueller might have been looking into whether Trump allegedly obstructed justice. Barr said in his confirmation hearing in January, however, that the memo was based on what he saw in media reports. He also pledged to allow Mueller to complete the investigation. Regarding releasing Mueller's report, Barr said during his confirmation hearing that his goal "will be to provide as much transparency as I can consistent with the law," but he stopped short of promising to release it in full.